The Industry 4.0 initiative imposes new requirements on cyber-physical systems in terms of interoperability, response time, communication capabilities, and more. A major approach to addressing these requirements is through the development and use of standard reference frameworks, architectures and models as well as the widespread and joint application of open industry standards. The aim of the article is to analyze the use of standards under the Fourth Industrial Revolution as well as to present and analyze some of the most applied standards in the field of monitoring and control of cyber-physical systems, such as AutomationML, OPC-UA, IEC-61449, IEC-61512. The reference architecture RAMI 4.0 was used to establish relationships and interactions between them. The paper is devoted to a problem of an interdisciplinary interaction of researchers in a framework of big and ambitious projects implementation. This problem is of immediate interest in the modern scientific community since it is necessary to solve problems from various fields of scientific directions. For the implementation of breakthrough interdisciplinary projects and for the interaction of experts from different scientific fields, ITMO University decided to establish an interdisciplinary Laboratory of cyber-physical systems. The paper is devoted to research of convergent technologies as a key factor in solving global problems in the new industrial revolution. It is shown that the concepts of the new industrial revolution, which today are widely used by Western scientists, also envisage the convergence of sciences and technologies and the creation of advanced manufacturing technologies on their basis. It is only possible to launch Industry-based trends in Industry 4.0 through the introduction of advanced manufacturing technologies based on convergent technologies. The approach to the periodization of scientific and technical development, which links the economic, technological and socio-political factors of development, as well as characterizes the structure of the sixth technological structure, the vision of the content of the new industrial revolution based on the organic combination of convergent NBIC-technologies with key factors, as well as approaches to solving global mankind issues are proposed. The recent subject of great research challenge and one of the most active area of research for well in materials science include the development of nanofiller reinforced polymer materials for additive manufacturing application. The dispersion of nanofiller in polymer matrix is a critical issue not only for control of processing but also for pre-defined properties. Quantitative analysis of extent of dispersion of nanofiller by measuring the rheological and surface characteristics of polymer nanocomposites has great technical importance for improving processing conditions, as well as for understanding the fundamental characteristics of materials at the nanoscale. The incorporation of nanofiller graphene into polymers is a promising approach to impart certain electrical and magnetic properties, mechanical reinforcement and high thermal conductivity to the resulting material. Rheological and surface properties of the poly(lactic) acid (PLA) based nanocomposites incorporating 0-9 wt.%. graphene nanoplates (GNPs) were investigated in the present work and a new strategy to tune such properties of PLA matrix by varying filler content is proposed. The goal of this paper is to provide a resource that can be used by the Augmented Reality research community and practitioners to understand the most recent potentials for application of the innovative Augmented Reality technology in various industry. Firstly, it is described mainly the role of the Augmented Reality in logistics and maintenance. 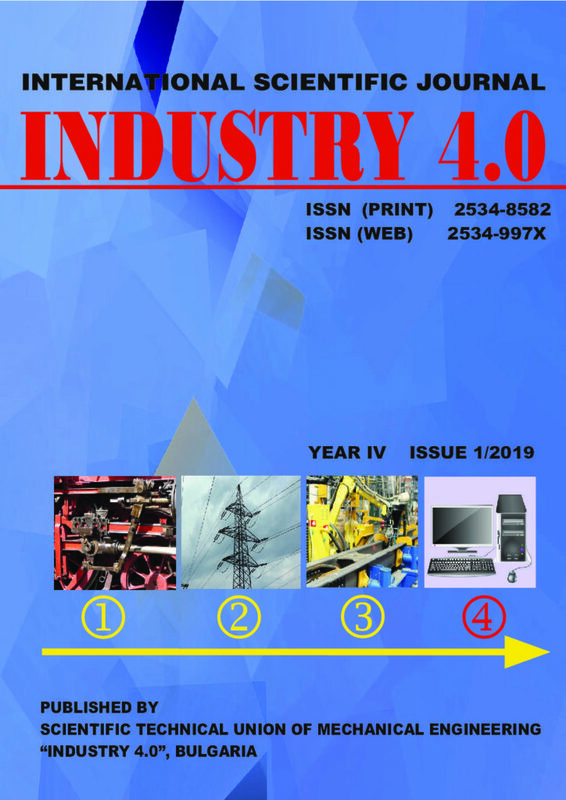 Secondly, the paper provides an overview of research papers in the period 2008-2018 in the field of Augmented Reality for facilitating and supporting industrial applications. By efforts of research, review and classification the author outlines both opportunities and challenges for spreading the Augmented Reality applications in smart manufacturing environments that will provide the baseline for further discussion and research in this direction. Presenting this survey the author aims at creating an active community that further discusses the future development of Augmented Reality particularly in Supply Chain Management. Future steps will be taken in research workshops and online community work. Describe the parameters influencing the depth of the laser marking of textile products. Experimental results are presented to determine the quality of cuts on felt surfaces of different colors at specific parameters – power and speed. The characteristics and structure of aerators based on titanium powders have been given, as well as the information about the effectiveness of their application when cultivating yeast cultures during milk whey processing. Information is perceived as the resource, that constitutes relationships in the network of enterprises and their customers, as well as extra-marketing value, which can be successfully implemented in IT environment, for example in the sector of waste disposal enterprises. That is why, the interactive contact and involvement of the stream supplier in researched sector, the intelligent processes of selection and recycling of communal waste, and commercial and marketing value of waste can be interesting as a source of marketing information for researchers and readers of this article. Therefore, smart methods of knowledge management, including marketing knowledge in the sector of waste management enterprises in the environment of IT solutions raise interest. The goal of the paper is to present three-sphere business model based on intelligent management of knowledge and competences in enterprises of the waste management sector. The main part of the paper will be focused on one of the sub-areas of the model, i.e. the subarea of knowledge commercialisation. This will be implemented through in-depth case study analysis. The article is dedicated to studying and comparing the indicators used to evaluate the educational activities quality of universities from various countries. In particular, the indicators of tuition fees, and expenses for the separate indices of inputs for educational activities are being investigated. The ratio of universities tuition fees to incomes of the educational services consumers is being simulated. A startup is starting an innovative enterprise that has in establishing greater business risk and successful beginning is likely its rapid growth. Exponential growth is an attraction for many investors who are actively searching for new startups and investing in them with the hope of going to be another Google, Facebook or Twitter. The paper describes the incubation program of WAYRA, which is one of the world’s largest business incubators. We have been dealing not only with the exited startup but also with the currently incubated WAYRA CEE in Prague. We evaluate their potential, strengths and weaknesses, opportunities and threats in the discussion. The enterprises in today’s competition environment should obtain and use the technological production systems, qualified, and proper information media that industry 4.0 conditions necessitate. Because a new rival firm may start to use smart factory technology in every new day. In this research, some of the ready-made enterprises in Trabzon were examined by semi-structured face to face interview and natural observation techniques to determine the utilization levels of industrial 4.0 technologies. Besides, this research made suggestions for those enterprises about the innovations that can perform in the future. In conclusion, it can be understood that whether the enterprises reviewed have the operation and employee structure to use the smart factory system. The enterprises need to apply the lean production necessities into internal processes by vertical integration; afterward, the same enterprises need to apply the agile manufacturing strategies in the external processes by the horizontal integration to start to use industry 4.0. Every business organization faces a crisis at a certain point in its development. Crisis phenomena for overcoming preventive measures can lead to serious economic and social problems for the organization or its bankruptcy. The crisis is a widely held view and its indications affect different aspects of the financial, social, spirit life of the nation. It’s important to accent not only to the consequences of its manifestation but also to the opportunities for overcoming. This study focuses to analyze the factors for creating conditions for business entrepreneurship in order to draw attention to the opportunities for achieving lasting success for the Bulgarian society. This report aims to systematize key factors for the emergence of crises and their impact on innovation and entrepreneurial mindset. A questionnaire was used to collect data from a sample of 215 entreprises which were selected through stratified random sampling method. Collected data were analyzed using descriptive and inferential statistics with the aid of Statistical Package for Social Sciences (SPSS). The study revealed that innovativeness, creativity, business alertness and risk taking were significant for successful implementation of innovations and affecting performance of Bulgarian enterprises. The results show that crises are somewhat the driving force behind the creation of innovation and are a prerequisite for the emergence of modern forms of entrepreneurship so necessary to stabilize the economic system.